The new Club website was up and running in January. This was a huge undertaking in order to improve the club’s presence in the community. Diane S. Lindsley, who was already the Club’s Advocacy Chair, began serving as Advocacy Chair for District 6. 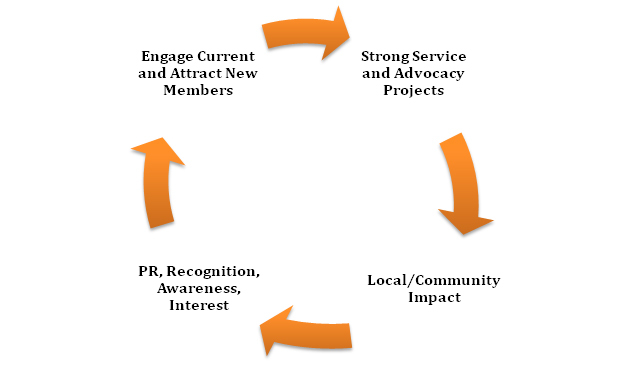 Working with Zonta Advocacy Liaisons in Illinois, Indiana and Wisconsin, a district Advocacy platform was developed with specific actions for clubs to take. This format was highly successful and was continued through the District 6 2012-2014 Biennium. Jacqueline M. Beaudry was elected a Zonta International Director and served from 2010-2012. At the same time, she continued as Zonta International development Committee Chairman for that biennium. In 2010, the Club lost Zontian Shirley Marie Bell at 73 and Ruth Cummings at 82. Shirley had retired from teaching with MPS after 29 years of dedicated service. For many years, Ruth was Chair of the Club’s Hospitality Committee and worked on the Fashion Show Committee. Zonta International’s Convention that year was in San Antonio. Zontians Sandra Miller, Donna Conant, and Audrey Schmitz arranged for a bus trip from Milwaukee to San Antonio for Zontians from Wisconsin, Germany and Italy. Stops included Chicago, Springfield, Memphis, St. Louis and New Orleans. Along the way we were hosted by our sister Zontians. At this Convention, Jacqueline Beaudry was elected as a Zonta International Board Director for the biennium. In November of 2010, with the help of many members through painting, decorating, assembling baby furniture and monetary donations, a new mom and her baby are able to enjoy a newly renovated room with all the comforts of home at St. Catherine Residence. This was the year that the Club joined Facebook. We knew that we needed more exposure on social media. March was a big month. Pam Knackert received a Green Bay Packers Community Award of $1,000 which she donated to the Club’s Foundation. On March 8th, Club members observed International Women’s Day by participating in legislative advocacy training with the Wisconsin Council on Families and Children. This training and meetings with legislators continued through 2014. 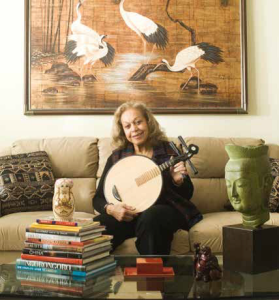 In April, Zontian Aileen Rockjordan was featured in Milwaukee Magazine. As a trailblazer, Aileen worked as a timekeeper for the Brooklyn Navy Yard right out of high school. She then was one of only two production welders. While at Long Island university, Aileen was the only woman and the only minority in the business school. She received a Master’s degree in business administration from NYU and broke the color barrier again when hired in executive positions in retail. Later in life, Aileen was a tenured professor in social work at UWM. In Fall, 2005, UWM’s publication Visions wrote: “Despite earning numerous degrees and working as a production welder to pay for her undergraduate degree, Aileen faced discrimination for her ethnicity and gender at almost every turn. She didn’t let it slow her down, though. Aileen continued to celebrate diversity instead of closing herself off from other cultures.” Upon retirement with emeritus status in 2004, she created the “Aileen Rockjordan Endowed Scholarship” in the Helen Bader School of Social Welfare, demonstrating a commitment to promoting cultural diversity in the delivery of social services. She was a past president of the Zonta Club and continued to be an active member. Aileen’s philosophy was, “You only live once; but if you live it right, once is enough.” Sadly, we lost Aileen in August of 2013. In May, Zontian Karen Coy-Romano of UW-Parkside received the Milwaukee Business Journal’s “Mentor Woman of Influence” award. Advocacy efforts continued in September when Zontians Cheryl Lucas-DeBerry and Diane Lindsley joined with members of the Women’s International League for Peace and Freedom’s meeting with representatives from the US State Department at Mt. Mary College. The subject was Security Resolution 1325 “Women, Peace and Security”. Although the State Department was primarily concerned with women’s plight in other parts of the world, we were able to show parallels with women in the US. At our holiday party in December, we collected items for Sojourner Family Peace Center. 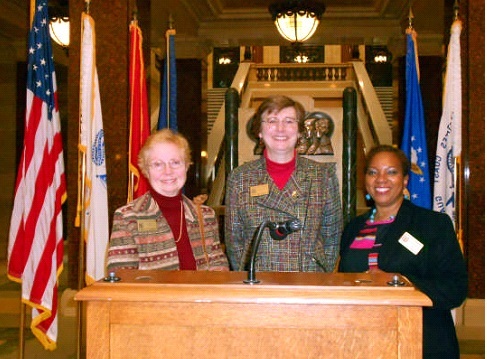 In March 2012, Pam Knackert and Diane Lindsley presented Zonta’s Mission and focus at “Women Who Make a Difference”, a women’s history program presented by Womanspirit of the First Unitarian Church of Milwaukee. Zontian Jacqueline Beaudry was nominated for the Milwaukee Business Journal’s Woman of Influence award. She was recognized by Zonta leaders at International, District and local Club levels for inspiring those with whom she works. Jackie was also continuing as Zonta International Development Committee Chairman for the 2012-2014 Biennium. Beginning in 2011 and continuing in 2012, Zontian Service Committee Chair Donna Neal led the Club in a process to determine the type and scope of future service projects. Deciding to focus on the prevention of violence, the Club chose Neu-Life Community Development at 2014 W. North Ave. in Milwaukee. Their Mission is to “empower children and youth by equipping them with the necessary information, strategies and support systems to have better self-images, develop better life management skills and to cope with their environments by refraining from crime, drugs and other deviant behavior. 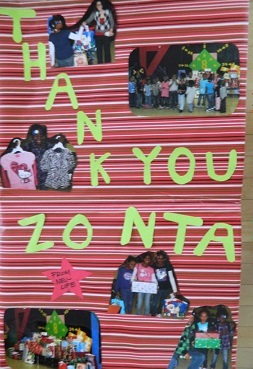 It is the belief and philosophy of Neu-Life that basic foundations of personal accountability, responsibility and respect for life can be rebuilt.” Zontian input included mentoring girls for the “Girls on the Run” event, assisting with the annual art show fundraiser, supplying backpacks with school supplies, and providing Christmas presents. Service at Neu-Life began with a Christmas party. The Gwen T Jackson participants in Neu-Life were thrilled to attend the celebration, groups sang carols or recited poetry as part of the program presentations, and all students received a gift, no exceptions. Because it was the holiday party, many parents were also in attendance. While many Zontians were not able to attend, seven Zontians were present and engaged in the celebration activities and interacted directly with the children. Zonta was given great credit at the event and Zontians were also afforded the opportunity to interact directly with the children in the program. In early 2013, Zonta International needed an interim Executive Director. Jacqueline M. Beaudry met the challenge and served from February to July of 2013. Zonta International signed onto to a letter urging the ratification of the CEDAW treaty. It was delivered to the US Senate. To further educate Club members about CEDAW, an article from USA Today was reprinted in the Club Newsletter. Later in the year, the Newsletter provided information on Equal Pay and upcoming Domestic Violence legislation. Continuing with awareness of issues affecting women and girls, the February dinner meeting featured Claudine O’Leary an authority on Human Trafficking. Club members were the first to hear what occurred earlier in the day at a conference Claudine and Zontian Diane S. Lindsley attended on human trafficking that was sponsored by the US Attorney’s office, among other partners. It was entitled “Not for Sale”: Wisconsin’s Response to Human Trafficking. 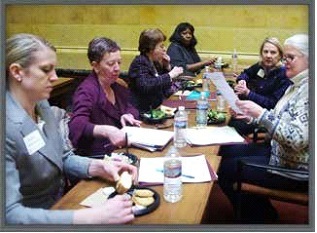 In recognition of International Women’s Day (also referred to as Zonta Rose Day), on March 8th, Club members attended an advocacy workshop in Madison followed visits to their legislators. Participants gained insights into three major advocacy issues and developed their advocacy skills through training and speaking with legislators or their staff. Each participant received a copy of the “Legislative Advocacy Guide” prepared by the WI Council on Children & Families. In turn, the legislators and staff learned more about International Women’s Day and Zonta. For those Club members unable to attend the event in Madison, they were invited to an International Women’s Day celebration at Milwaukee’s Performing Arts Center on March 10th. Club member Diane S. Lindsley represented the Club on the event planning committee comprised of a diversity of Milwaukee women’s groups. Our March dinner meeting addressed Domestic Violence featuring former Zontian Carmen Pitre, Director of Sojourner Truth Family Peace Center gave highlights of future plans for expansion and that the Center is looking forward to being the recipient of local, state and federal grants to assist them in the work. May’s dinner meeting featured Eve Galanter from the Wisconsin Women’s Network in Madison. Their mission is to advance the status of woman and girls in Wisconsin through communication, education, and advocacy. 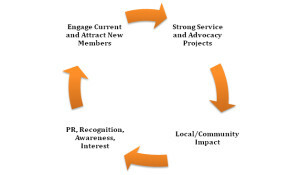 In Spring of 2013, Diane S. Lindsley – District 6 Advocacy Chair – was asked by Kay Meyer, Zonta International Advocacy Chair, and and ZI President Lynn McKenzie to assume the role of Zonta Regional Advocacy Representative for North America. This responsibility involved coordinating the advocacy efforts of the 13 Zonta districts in North America. The Club’s annual themed fashion show fundraiser continued its long successful history. Net funds raised were now over $20,000 due to individual and corporate donations, raffles, silent auction, and wine cork pulls. Pam Knackert and Helen Ludwig, Chairs of the Membership Committee, continued to hold prospective member receptions. Successful fundraising fashion shows attract potential members who are inspired by our commitments to service, advocacy, and scholarships. Our Neu-Life Mini-Service project was a donation of color construction paper, crayons, colored pencils, and blunt point scissors for kids, regular glue, glue sticks, and other arts & crafts supplies that Neu-Life kids can use over the summer months. In late Summer, Club members donated 69 backpacks filled with school supplies. In November, six Zontians – Kristin Greenwood, Maria Bellmann, Helen Ludwig, Joni Reese, Chris Todd, Dana Felton Reinhard, and Donna Neal – were Running Buddies for the Girls on the Run 5K Race. The Zonta Club of Milwaukee was pleased to award Mollie Sue Zuberbier our Jane M. Klausman Women in Business Scholarship for $1,000. Mollie will be entering her 4th year at Milwaukee School of Engineering where she is pursuing her BS in International Business. Mollie went on to receive the District 6 Klausman Scholarship for $5,000. The Club’s Young Women in Public Affairs Scholarship for $1,000 was awarded to Anjana Murali. This was the year we began using Twitter. The Club’s Program Committee continued to tie dinner meeting speaker topics to Zonta themes and issues – Amelia Earhart, Women’s Health, Volunteerism, Hunger, the United Nations, and Advocacy. Under the direction and coordination of Zontian Donna Neal, the Club’s service program partnership with Neu-Life Community Resource Center was the District 6 submission for the Zonta International Service Project Award. It included Back-to-school backpacks with supplies, holiday gifts, Girls on the Run 5K Race, advising on their annual art show fundraiser, and financial support of $2,000 in 2012 and $5,000 in 2013. In 2014, Zontians participated in Neu-Life’s Career Day. Secondly, the Club piloted and implemented a self-sustaining Youth Anti-Violence Project (age 10+) focused on human trafficking and sexual violence prevention. It provided participating youth the skills to help keep them safe as well as the opportunity to make an impact in the larger community through awareness-building, peer advocacy, and/or service. 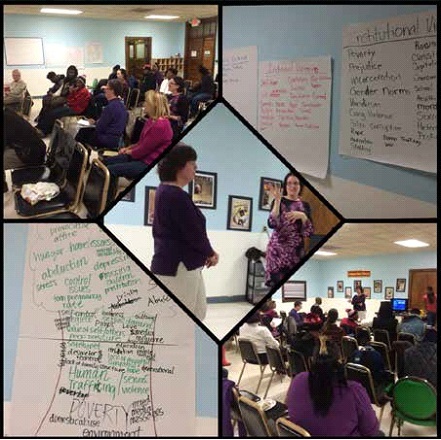 We utilized (and customized) a curriculum called ARTREACH and TIPS, developed by Human Trafficking Awareness Partnerships (www.htap.org), a Zonta-driven effort in west Florida by Nola Theiss, to implement this program. Six Zontians (Donna Conant, Joann Harris Comodore, Diane Lindsley, Cheryl Lucas-DeBerry, Donna Neal, and Joni Reese) and 15-20 Neu-Life staff and alumni attended the training/brainstorming session conducted by Claudyne O’Leary. Our volunteer support continued throughout the year with Career Week, back to school backpacks and supplies, Youth Harvest Fest, Artreach, Girls on the Run, and Holiday Gift Drive. Kristen Greenwood, Donna Neal, Jackie Beaudry, Joann Harris-Comodore, Donna Conant and Karen Hunt hard at work preparing to meet with their legislators. International Women’s Day was observed by Club members attending the 3rd Annual International Women’s Day Advocacy Workshop in Madison. Issues addressed by Zontians in Area 2 included Human Trafficking, Domestic Violence and Economic Security. From Advocacy Chair Karen Hunt –a “big thank you to my fellow Milwaukee Zontians Jackie Beaudry, Donna Conant, Kristen Greenwood, Joann Harris-Comodore and Donna Neal for braving the blizzard like morning conditions to travel to Madison to advocate on behalf of women and girls in Wisconsin. Because of you, our elected officials understand that women’s issues are important to all Wisconsin-ites. Because of you, our elected officials understand better the importance of their votes supporting the end of violence against women, the end of slavery for women trapped in human trafficking exploits and the importance of securing the economic status of women in Wisconsin”. A second opportunity to observe IWD was the celebration in Milwaukee at the Marcus Center for the Performing Arts entitled “Inspiring Change: Connecting Our Voices” was organized by members of several Milwaukee women’s organizations, including Diane S. Lindsley representing our Club. A third International Women’s Day Program March 8, 2014 entitled “Why Women, Why Now”was sponsored by The Women’s International League for Peace and Freedom, the Greater Milwaukee UN Association, 9 to 5, and Womanspirit at the First Unitarian Universalist Church on Milwaukee’s East Side. 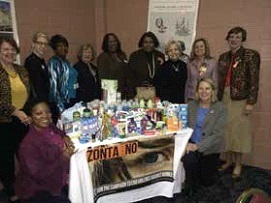 Donna Kahl-Wilkerson and Diane S. Lindsley attended, representing Zonta. Diane spoke of Zonta’s ties to the United Nations and our Club’s current anti-violence/anti-trafficking programs with Neu- Life. Audience members were impressed with our efforts and commitment. At the April Club business meeting we voted on the Neu-Life proposal request for $10,000 for their capital campaign. The Club voted to donate the $10,000 to be used to sponsor the Youth Art Room in their renovation project. The Zonta Club of Milwaukee will get signage to the room and our members can participate in the joint Zonta/Neu-Life youth mural. Our $10,000 is coming from the Zonta Foundation, Inc.
Also in April, Donna Neal, Pam Knackert and Diane S. Lindsley attended a Human Trafficking Forum at Alverno College. Panel discussions centered around factors that have made Milwaukee a hub of human trafficking, types of trafficking, and the scope of the trafficking. In May, the Club awarded a $500 Young Women in Public Affairs Scholarship to Alma Lopez who exhibited high grades and many hours of volunteers efforts at MPS and Walker’s Point Youth & Family Center. A second scholarship was awarded to Helen Fetaw, a truly outstanding graduate of Rufus King International High School, is now a freshman at the University of Pennsylvania studying pre-medicine and biochemistry with the hopes of one day working with Doctors Without Borders. In September, the Club awarded the $1,000 Women in Science Scholarship to Marisol Ramos from Alverno College. As a wife and mother of two, she has excelled academically, completed two internships at the Medical College of Wisconsin, and has generously volunteered her time both at her college and in the local community. The $1,000 Jane M. Klausman Scholarship was awarded to Megan Fitzpatrick from UW-Milwaukee. Her academic hopes are to complete her degree, pass the Certified Public Accountants (CPA) exam, study in Germany for a graduate class, and earn her Masters in Accounting . Personally she hopes to continue to be a mentor and inspire other women. Monica Crosby of UW-Milwaukee received the $1,000 Women in Technical Specialties Scholarship. Her dream is becoming an Information Technology (IT) professional with the FBI. In this 2014-2016 Biennium, Zonta International appointed Jacqueline M. Beaudry as the Zonta International Foundation Centennial Anniversary Endowment Campaign Chairman. This is an extraordinary honor and responsibility and the Club again is very proud of Jackie.